Register Log In ECN Forum Forums Photos for General Discussion No Main Breaker? Was this panelboard legal for use as Service Equipment? If so, were there any restrictions? There was no label inside the cover. If you look at the lower Buss there are 12 spaces there. This panel could easily (and did) exceed the maximum # of disconnects. The only way it could comply would be with all 2 pole breakers installed there and that's not likely to happen. 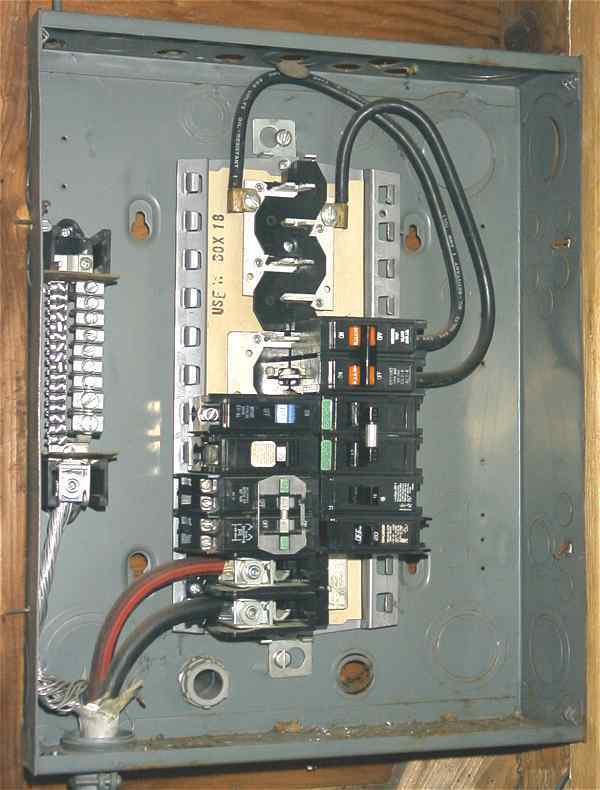 This "split-bus" panel typically has 6 double-pole breakers as the "power section" feeding the range, dryer, AC, etc. Also, a 50 or 60 amp breaker to feed the "lighting" section in the top half. Used in this manner, it would meet the "six operations of the hand" rule with regard to Servive Disconnect. However, if it is considered a lighting & appliance panel (which it probablty is) it would require a main. If there is an advantage, can we have this advantage in the extreme? Let's have a split bus and a sub-feed breaker for every circuit! This was suitable for use as Service Equipment. From your photo, the lower 12 pole section was for the "Mains" (before we started calling them Service Disconnects). Then, as now, there could only be a maximum total of six operations of the hand to disconnect the service from the load (up to 6 single poles breakers, 6 double pole or a mixture totalling to a max of 6). The size of the service conductors were based on the calculated load at the time of installation, plus any room for expansion that may, or may not, have been added. I look at this photo and see it as upside down. I helped install a lot of residential split-bus panels when I was apprenticing. Even with the "Lighting Section" bus being rated for tandem breakers, over time, I've seen these fill up, and the "open spaces" in the "Main Section" mistakenly (or deliberately) used for branch circuits. As always, there's no accounting for those who will do anything to get the job done quick and cheaply. The real attraction to this was the lower material cost. I remember a lot of GE panels, bus only, not a single breaker in them. The leads to the "Lighting Section" were factory installed, but the choice of breaker was up to the installing electrician. If all the "Mains" are 70 Amp or smaller, the higher cost breakers are not used. I see it as upside-down too. I see quite a few panelboards (even with main) installed upside-down presumably to save a few feet of cable. I don't remember seeing ones like this with so many spaces (12). Can you tell if this neutral bar is bonded? I don't see a strap. I don't thonk this was the original panelboard for this house, It was most likely a 100A originally because there was a #6 solid Al cut just above the panel and a #4 Al running to the water main. The bus isn't protected at 200 amp. It is not protected at all. These panels are fed directly from the meter. They were not sub-panels. I guess the cost advantage was in not supplying a 200 amp main breaker.